Struck as the second 2013-dated release of the US Mint’s America the Beautiful Silver Bullion Coin® Program was the 2013 Perry’s Victory Silver Bullion Coins. 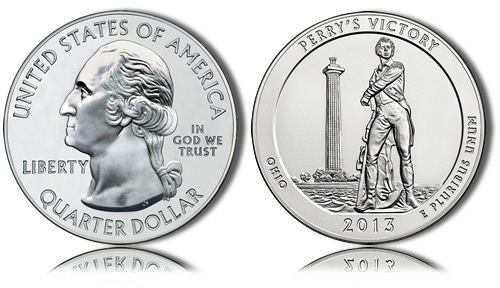 The Perry’s Victory Bullion Coin was released by the US Mint on June 3, 2013. Each of them is struck from five ounces of .999 fine silver to a diameter of three inches and feature a reverse design emblematic of Perry’s Victory and International Peace Memorial found in the state of Ohio. These Perry’s Victory strikes continue the silver bullion coin series which debuted with 2010-dated strikes and were created by the same authorizing legislation as the America the Beautiful Quarters. In fact, these silver bullion coins contain the same basic designs as found on the America the Beautiful Quarter series including an obverse portrait of George Washington and reverse designs emblematic of the selected site of national interest such as Perry’s Victory and International Peace Memorial which will be showcased on the reverse of this coin. Since each of these strikes are precious metal legal tender coins produced by the US Mint, there are three values associated with them – a face value, a melt value and a numismatic value. The face value is the simplest as it is based on the quarter dollars from which these coins take their designs and is twenty-five cents. Second, each of these silver bullion coins are struck from the aforementioned five ounces of silver giving them an intrinsic melt value. This melt value is based on the fact that if you were to melt one of these coins down, you would be left with approximately five ounces of silver and as such, each coin is worth approximately what that amount of the precious metal would currently be trading for. Finally, despite being a bullion product, some collectors may also be interested in these coins. If so, they would have a numismatic value which would take into account the melt value of the strike, but would increase based on the perceived rarity of the coin as well as its condition. The rarer or better quality of the coin, the higher an amount it may be worth to a collector. These Perry’s Victory and International Peace Memorial Silver Bullion Coins each contain an obverse portrait of George Washington. This image of the first President of the United States was designed by John Flanagan and seen initially on the circulating 1932 quarter dollar. That same image has been in use on the quarter dollar in one form or another ever since. "The reverse design depicts the statue of Master Commandant Oliver Hazard Perry with the Peace Memorial located in the distance. The memorial is one of the tallest of its kind in the U.S. Inscriptions are PERRY’S VICTORY, OHIO, 2013, and E PLURIBUS UNUM. The reverse was designed and executed by United States Mint Sculptor-Engraver Don Everhart."